At first i wasn’t too sure about this dish , although the picture looks really good and really tempted me to try it . I finally decided to give it a try , although with slight modification , i didn’t use pork belly , instead i used ham ( leftover from christmas that i froze ) , and i didn’t use spam , or american cheese . 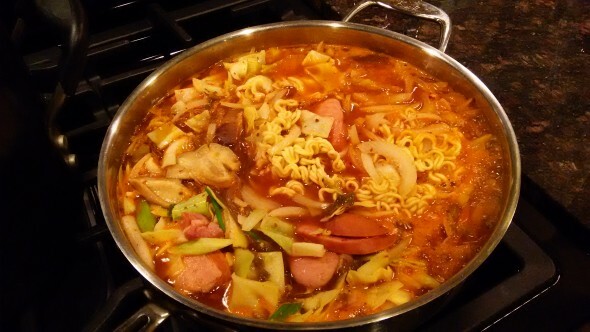 But i used everything else , including rice cake , baked beans , kielbasa , cabbage , glass noodles and ramen , also rice cake . This is what i like about soups and stews , the aroma when cooking the anchovy kelp based broth always fills the house , makes me even hungrier and can’t wait the food to finish . I was right , the food turns out delicious , not to mention how easy this was and less mess . My husband loves it , and my 10 years old son gobbled it up , so i will sure make this again soon !! Posted on Thursday, January 8th, 2015 at 10:12 am. Posted January 21st, 2015 at 8:18 am | Log in to reply. Hi Emily !! We actually think that this stew develop a better flavor the next day !! I’ve made this stew 2 times just from this month . It is delicious and we really enjoyed it a lot , thank you for showing us how to make this yummy stew . Oh and because of Korean food , Nick now loves spicy food LOL .. how funny is that !! Posted January 21st, 2015 at 8:54 am | Log in to reply. I’m so happy to hear that you and your family have been enjoying this recipe. “Nick now loves spicy food…” haha, You make all kinds of delicious food from many different cultures. You are raising a little foodie! Posted January 8th, 2015 at 10:20 am | Log in to reply.